As if legendary Fort Lauderdale Beach wasn’t beautiful enough from the sand or at a waterside restaurant, you can soak in our beauty from above! Who needs Google Earth when you can see Fort Lauderdale for yourself as you glide above our crystal-clear blue Atlantic waters, keeping company with the seagulls and pelicans while gently nudged aloft under our Parasail. Our state-of-the-art 31-foot CWS can accommodate up to 12 passengers as you become a part of the Fort Lauderdale Beach skyline, if for only a short time. Our certified and seasoned crew will ensure gentle, relaxing dry takeoffs followed by a refreshing yet exhilarating landing. We have a wide array of inspected and certified Parasails that can support up to THREE riders at any one time and in any wind condition. You’re as steady when suspended 200 feet up in the air as you are dipping your toes in the clear, blue water – we can even give you a refreshing dunk if you’re so inclined. The joy and exhilaration of our Parasailing adventure is matched only by our dedication to the safety of you and all aboard our vessel. The RentalBoats.com crew has completed rigorous flight operations training and possesses all U.S. Coast Guard certification. 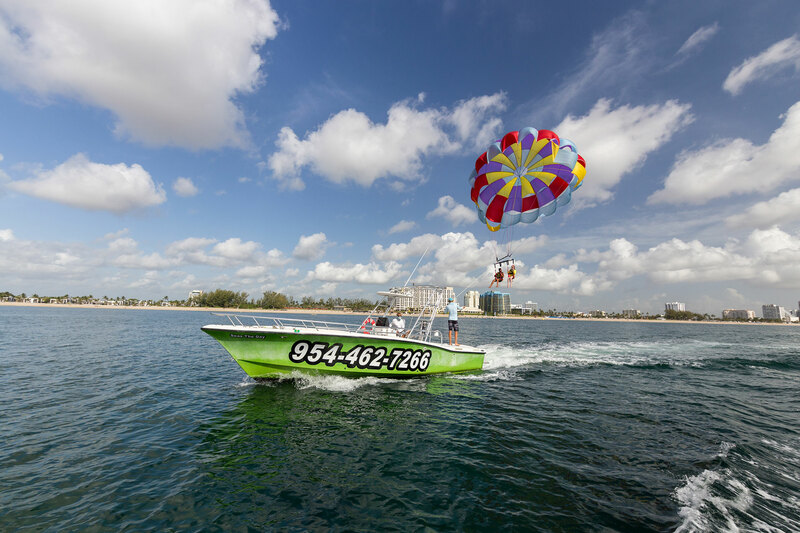 RentalBoats.com also fully complies with the ASTM F3099 Standard that pertains to the following aspects of parasailing operations in Florida: Weather, Equipment, Operations, Crew and Patron Responsibility. Please feel free to ask our crew about our qualifications or safety record. We at RentalBoats.com are proud of our safety record and take your safety seriously. *Parasailing leaves from our Fort Lauderdale Location.